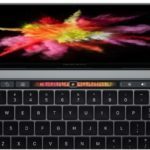 Apple’s new 13 and 15-inch MacBook Pro models finally made their debut this morning at the company’s special event in Cupertino. The highlight was the addition of a new Touch Bar, integrated with Touch ID, packed into new thinner and lighter aluminum designs. 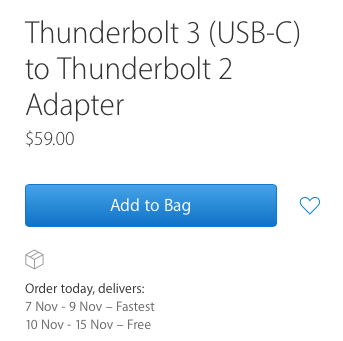 If you need to hook up a Thunderbolt display or external hard drive that takes Thunderbolt to your new MacBook Pro, you’ll need Apple’s Thunderbolt 3 (USB-C) to Thunderbolt 2 Adapter, priced at $59 CAD ($49 USD) in the online store. Apple eliminated the SD card slot, older Thunderbolt port, HDMI, USB and MagSafe in these new MacBook Pro models. But, they did have the ‘courage’ to retain the 3.5mm headphone jack. With four multi-functional USB-C ports on each new MacBook Pro, it’s going to be a new way of life—#donglelife.